Sometimes, mascara alone just won’t give you the full, fluttery eyelashes you desire. 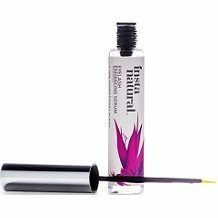 There are many companies though who say that they can with eyelash-thickening serums, and Instanatural is one of them. Let’s face it, few of us would say ‘no’ to the false eyelash effect, especially if it turns out we could have it naturally. Our review of this serum will uncover whether, in fact, it can lead to the ‘voluminous’ and ‘bat-worthy’ eyelashes it says it can in only 30 days. The company says these ingredients are clinically proven to work within 30 days and that the ingredients are plant-derived. In particular, it relies on SymPeptide XLash, a peptide, to spur the growth of healthy lashes that also have more length. Despite including clinically proven ingredients, there are yet other potent and key such ingredients that have been omitted. The most notable omissions are Marula Oil and Pea Sprouts. Fundamentally, we also don’t see any Vitamin E or B5. Both of these are crucial to strengthening lashes and keeping them in top shape, as you would with your hair, so it is hard to term this formula a maximum strength or maximum impact one. Amino acids and resveratrol are core to growth and protection, and these are also curiously absent. Unfortunately, the weight of what these missing clinically proven ingredients bring to eyelash health outweigh the benefits of the included ingredients to a larger, rather than lesser extent. Apply the serum along the base of your clean lashes. Dab away any excess serum. Allow it to dry before applying any makeup. Use twice daily for best results and you can also use this on your eyebrows. Although these directions are adequate we would have liked to know, for the sake of convenience, how long you should allow it to dry before you can apply your make-up. At the time of researching this review, the wand was available on sale from the product website for $24.97. The usual price is indicated as $30. The only real ‘discount’ incentive other than this is that orders over $35 are shipped at no cost to you. The manufacturer says they have a 100% money-back guarantee that is satisfaction-based. However, without any further details, this guarantee is virtually meaningless. It leaves you with no idea how long you have to initiate the return process, and if in fact you can return partially used products or not. Many guarantees phrased like this then subsequently spell out that you may only return damaged or incorrect orders sent to you – here there is no further information to go on. It seems like this has been done deliberately so as to be a barrier to getting a refund; in other words, you’d first have to make inquiries about what the policy entails from customer service. This is not the kind of showing synonymous with a manufacturer that has confidence in their product. We like the company’s philosophy of using natural ingredients and does not test its products on animals. Another plus is that the company is able to certify that it produces its ranges in GMP compliant facilities – this is something not many cosmetic companies have adhered to. That said, there is an under-representation of clinically proven ingredients in this formula. The particular concern is that it is not a long-term growth strategy as the protective properties of resveratrol are absent. As we explained under Ingredients, this is not the only widely researched clinically proven ingredient that does not show up in this formula mix. The company may or may not have incorporated one patented ingredient that we can see so although this is potentially a good start on the patent front, this still lags considerably behind the five patented clinically proven ingredients we’ve seen in a highly select handful of manufacturers. In multiple-patent formulas, every patent deeply targets one aspect of creating and maintaining full, long lashes, ensuring a full spectrum of benefits. This is not the case here. Finally, because the guarantee is so vague as to be meaningless, we are far from convinced this is a product you should be spending time and resources on. The customer feedback loop confirms this – the serum seems to work in some cases, in other cases it does not help at all, and sadly it also causes irritation and a burn-like sensation in some people’s eyes even if they have applied it correctly.